The Eigenharp is a ridiculously expensive, interesting new instrument developed by Eigenlabs in Devon, UK. There is the Alpha, which costs £3,950 and the Pico, priced at £349. 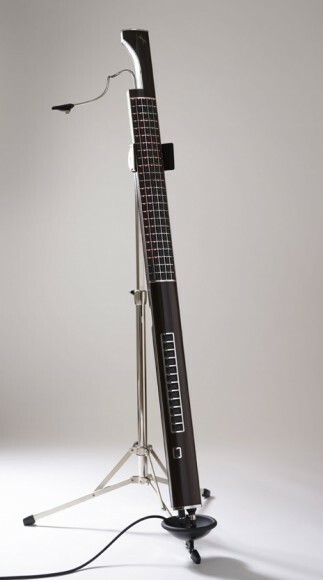 The Eigenharp, a crazy, science fiction instrument from Eigenlabs, comes on two forms, the “Alpha” (“Our professional level instrument allows the musician to play and improvise using a limitless range of sounds with virtuoso skill. It has 120 playing keys, 12 percussion keys, two strip controllers and a breath pipe. Available in a variety of custom finishes.”) and the “Pico” (“It’s ideal as a solo instrument or for playing in a band. With 18 playing keys and 4 mode keys, a strip controller and breath pipe, the smaller Pico has the majority of the playing features of the Eigenharp Alpha. It plays an unlimited range of sounds and is available in two finishes.”). Check out the stunning performance of the Bond theme. It’s a cool instrument, but is it really >$6000 cool? I think my favorite Tesla coil song is the Dr. Who theme. Everyone’s heard of Pandora, but what about Musicovery? Musicovery defines itself as “interactive webRadio.” It allows you to listen to a music channel based on your mood, specified genre(s), and a specified time period. You pick something in between four different moods: Energetic, calm, positive, and dark. Then you pick a genre and a time period. I find it a little difficult to find a balance that includes songs and artists that I like. But once I find that sweet spot, it’s really cool. I also find the genres to be a bit off sometimes. For example, I selected “folk” and chose 2000s as the time period, and Musicovery pulled up some music that I wouldn’t really consider folk. While I was expecting to hear music similar to artists such as Jose Gonzalez, it instead played songs from artists like John Mayer. I guess I can see how some of John Mayer’s music could be categorized as folk, but it specifically had “Your Body is a Wonderland” in the Folk genre. I always thought John Mayer was classified as Pop music. The coolest feature is the “Discovery” button. It plays music from lesser known artists, and I like to use Musicovery as a tool for finding new music that I might like. Overall, Musicovery is a great free music listening service. You can pay a premium for more features, but lets hope that the basic features remain free of charge. Here is an interesting interview with Last.fm on Cnet UK. I use last.fm, but I’m not entirely aware of all of the features they offer. I have my iTunes hooked up to “scrobble” my music plays, and I sometimes log on to see the data that last.fm has collected about my music listening habits. What’s really amazing is the amount of data that is going through Last.fm. Apparently 2750,000 years of music have been scrobbled on Last.fm. That’s pretty amazing. How much data passes through Last.fm? “One number that’s pretty cool is relevant to our recent Xbox launch. In our first week of use, 120 million minutes of music were streamed. “One thing that’s even more popular than our radio-streaming service is scrobbling — the process of sending the name of the track you’re listening to to Last.fm’s servers. You can scrobble from over 200 different online music services and desktop clients, such as iTunes, Winamp, Hype Machine, etc. This is an interesting article about Virgin Media’s trial of its new filesharing monitoring system. It says that right now they are using this technology merely to gather information about the amount of copyright infringing filesharing that’s occuring in the UK, and that the data they collect will be anonymous. It may be anonymous right now, but what does the future hold for this monitoring system? Will the British government eventually use it to prosecute copyright infringers? “To begin with at least, Virgin Media’s implementation will focus on music sharing. The ISP is preparing a legal download service in partnership with Universal, the largest of the four major record labels, which it hopes will be the “carrot” to Lord Mandelson’s “stick” of technical measures against those who persistently infringe copyright. You’ve probably (hopefully) heard 8-bit music, or chiptunes, even you aren’t aware of what it’s called. I recently read an interview on createdigitalmusic.com from the band Anamanaguchi. Anamanaguchi makes ridiculously awesome chiptune music from a hacked NES. “Vijith: How do you do write these sequences?